Very heavy diamond cut curb chain bracelet bearing Birmingham hallmarks for 1975. Diamond cutting adds sparkle to the links giving this classic watch chain style bracelet even more presence and pizazz Secured with a large heart shaped padlock the bracelet is great to stack or wear alone as a signature statement piece. The top of the padlock simply flips up to open the bracelet and it has the benefit of a long silver safety chain which adds to its decorative charm. Beautiful quality! MEASUREMENTS: 7 inches ( approx. 18cm) from end to end with the padlock measuring 24mm high and 15mm wide (1x3/4"). 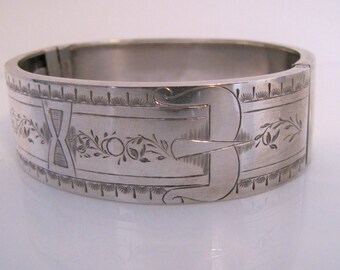 The bracelet is 8mm wide. HALLMARKS: Lion passant & anchor for Birmingham, date letter 'A" for 1975 on the padlock. CONDITION: Excellent with no flaws, the lock is in perfect working order and closes with a satisfying click. Beautiful bracelet, fit to be treasured! Please note the antique bracelet box is not included with purchase. Browse more exceptional fine and costume jewelry from every era - Georgian - Victorian - Edwardian - Art Deco - Modern - at mercymadge.etsy.com - With new arrivals added to our shop daily we offer an interest free layaway plan as well as a no risk guarantee. Our standard shipping includes tracking for your peace of mind and your purchase will arrive gift wrapped in a Mercy Madge box. Perfect for giving or safekeeping! 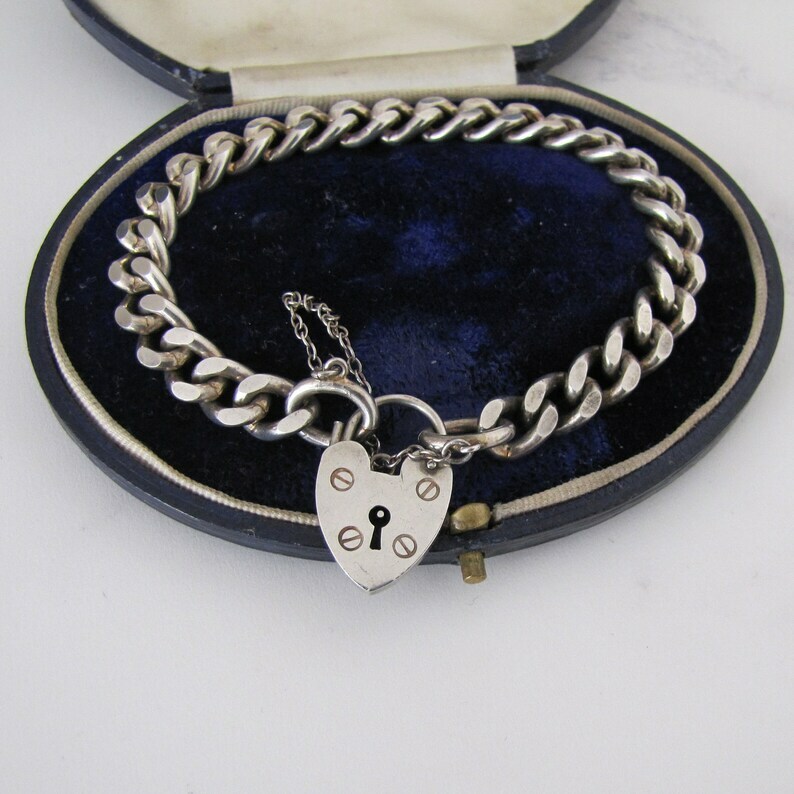 Antique Curb Chain Bracelet, Engraved Padlock Heart. English Watch Chain Silver Curb Chain Charm Bracelet. Victorian, Vintage, Unisex, Gift. Antique Silver Watch Chain Necklace. Victorian Silver Albert Pocket Watch Chain, 23", 72 grms. Long English Silver Graduated Curb Chain.